As far as I'm concerned, you can't have too many burp cloths with a new baby, and when my wild thing was little (which admittedly was quite some time ago), I always reached for the ones that were super-cute, as well as functional first. I promised a tutorial on these burp cloths a couple of months ago, but I haven't needed another baby gift until now. So, here is my method for creating adorable, yet oh-so-useful burp cloths; guaranteed to be loved by any new mom. And really- you can make an entire set of these cuties in under an hour. *three cloth diapers- flat folded and pre-folded mean slightly different things depending on the brand, just be sure that they are perfectly rectangular (some pre-folded diapers aren't), with a thicker middle and two seams. I have used the Babies R Us store brand and the Gerber brand, and both work well. I have seen some people use terry cloth, and that would work as well, but I love how the diapers get softer and softer with each wash.
*three fat quarters of flannel or minky fabric- of course, you can't find minky in fat quarters, so what I really prefer is to buy half-yard cuts of fabric, which will yield two burp cloths each, in a few different prints. That way, I can make coordinating sets of burp cloths, and I just keep the extra fabric to use for later gifts. 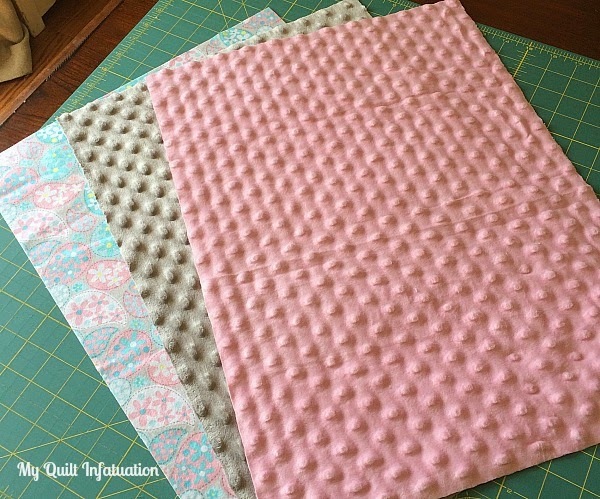 I usually try to keep a package of cloth diapers and flannel or minky fabric on hand so that I can make a set of these without even heading to the fabric store (not that I don't enjoy that, it's just that sometimes time is of the essence). Okay, time to get started! First, press your cloth diapers and measure them. Keep in mind that these are not always sewn very precisely, but that's okay. Next, cut your chosen fabrics to the same size as the cloth diaper. If your cloth diapers are not sewn with perfectly straight edges, just cut your fabrics as closely as you can to the size of the diaper. I promise it will still look awesome. 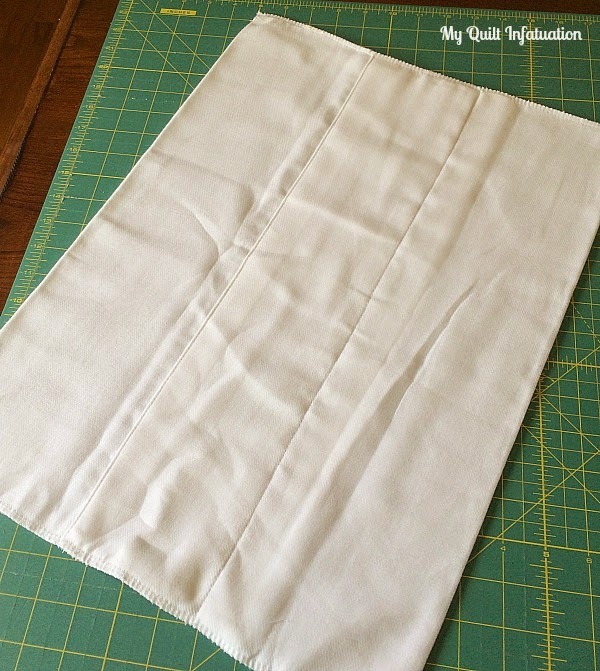 Sew the diaper and your fabric, right sides together with a quarter inch seam, using your walking foot as a guide. You can use pins to hold your fabric in place, but these are so small, I just like to hold it in place while I sew. 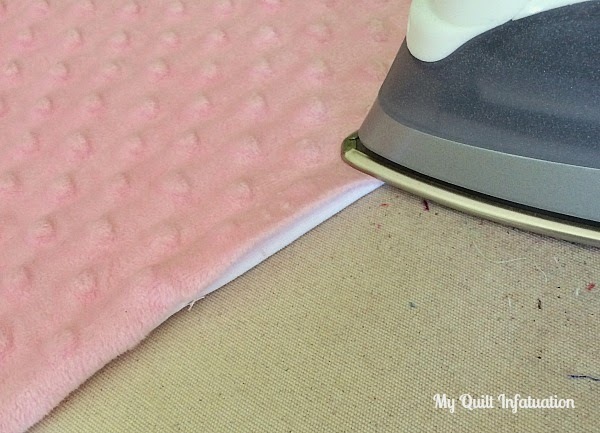 *if you want to attach a decorative edge to the burp cloth like ric rac, now is the time! Just lay the trim between the two fabrics, with the edge aligned with both fabrics. When it is turned out, it will create a cute decorative touch. If I have ric rac on hand, I like to use it, but if not, I don't worry about it. These are still cute without! Make sure to leave an opening large enough for your hand, so that you can turn it right side out. 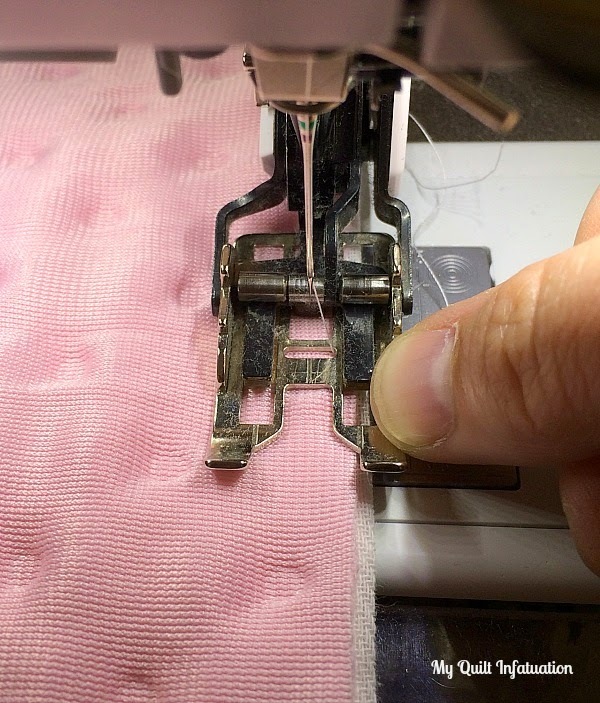 Be sure to backstitch when you start and stop sewing so that it doesn't pull apart. To reduce bulk, and to get a nice, crisp corner, make a diagonal cut across each corner. Take extra care to avoid cutting your stitches! Also, if you have any excess diaper sticking out (where it was not sewn straight), trim it up now. Time to turn it right side out! Use your finger to push the corners out to make them as sharp as possible. Smooth it out, then turn the edges of the opening to the inside, and press. 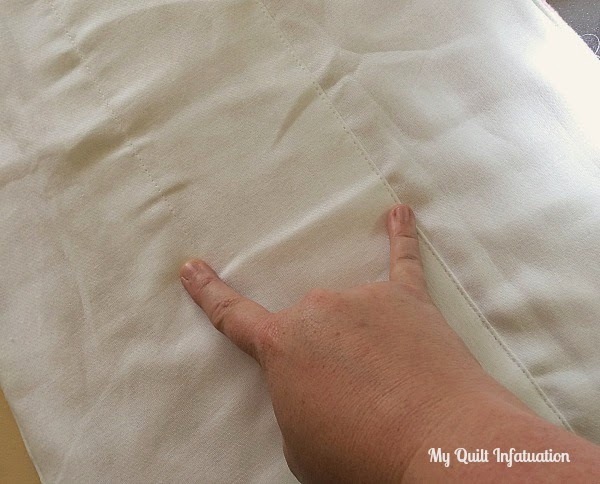 Creating this little crease with the iron will really help when it's time to sew it closed. Next, topstitch all the way around the cloth, including over the opening. I usually sew this seam fairly close to the edge. Almost done! Just two more straight seams, and that's it! Turn the burp cloth over. See these two seams that run along the length? 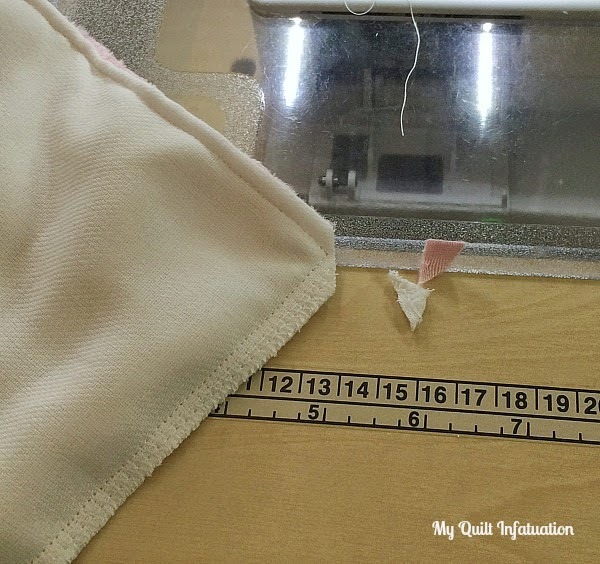 Use them as a guide for your two quilting lines. 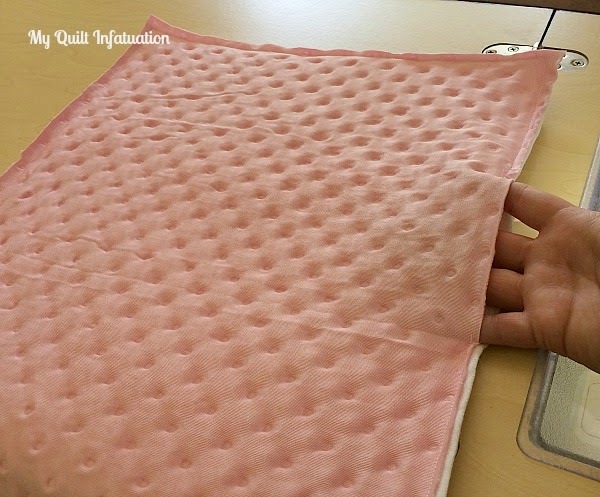 The two lines of quilting are just enough to hold the fabric in place. Again, be sure to backstitch when you start and stop your sewing. And there you have it! 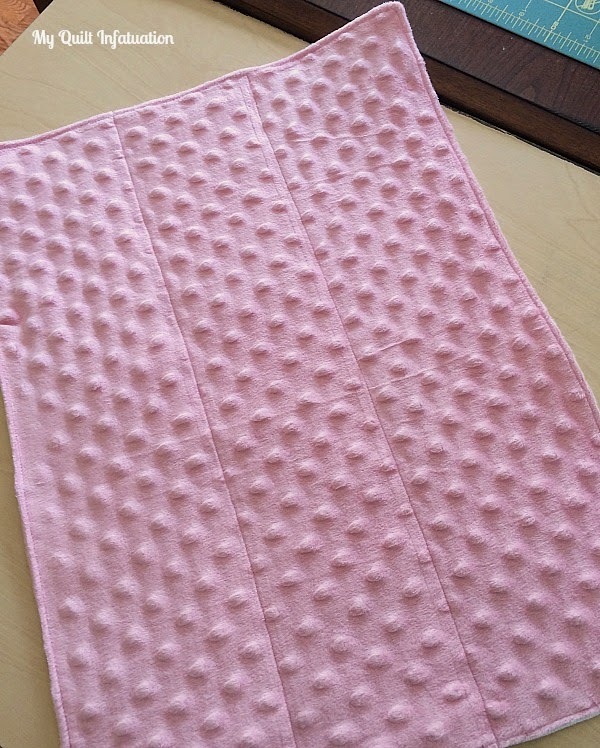 A soft and cuddly burp cloth that absorbs a lot, and is fun to snuggle with! I like to cut a strip of fabric from the scraps and tie them up in a sweet little set. There are so many different flannel fabrics available that these are simple and fun to personalize. You can make them to match the nursery, or can turn them into sports swag for the tiniest of fans. The sky's the limit! Handmade gifts are such a treasure, but I know that sometimes there is just not enough time in the day! 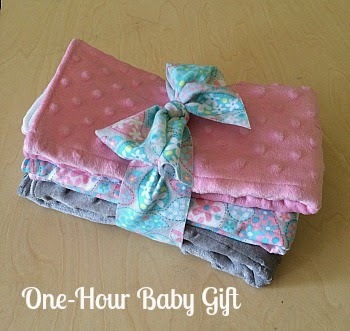 Well, the next time you're in a rush, and need a quick and easy baby gift, I hope you'll give these a try. Whether you give them as a stand-alone gift, or as a little handmade "extra," they are sure to be loved! I love the idea of using minky, so cuddly and soft! Awesome tutorial, thanks for sharing!! Very cute and such a great idea. Back in the Seventies when I first started counted cross stitch, I used that medium as a way to decorate pre-folds for use as burp-cloths. Your idea is even neater, quicker and easier to clean-no worry about the threads loosening. Thanks for sharing this tute. I bet lots of folks use it as a way to personalize gifts for the new mamas in their lives. You're the best, Kelly. This is such a great gift idea! Thank you so much for sharing the tutorial! These are great! 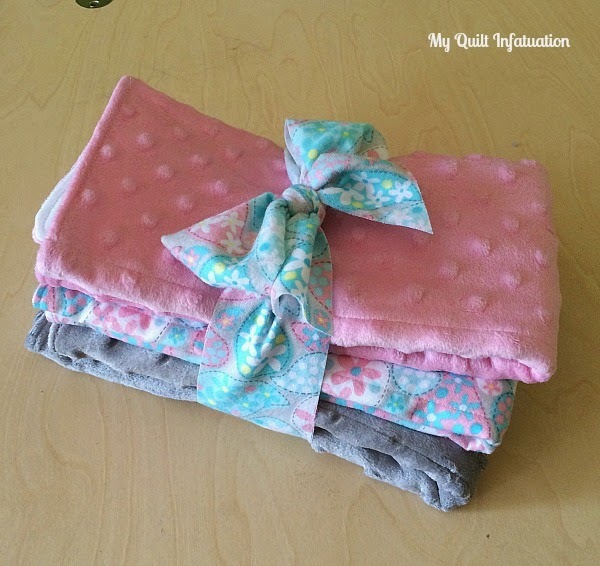 I have a new baby coming in the family and have been looking for more baby girl gifts to make. I plan to include a few of these burp cloths. Thank you for a great tutorial. 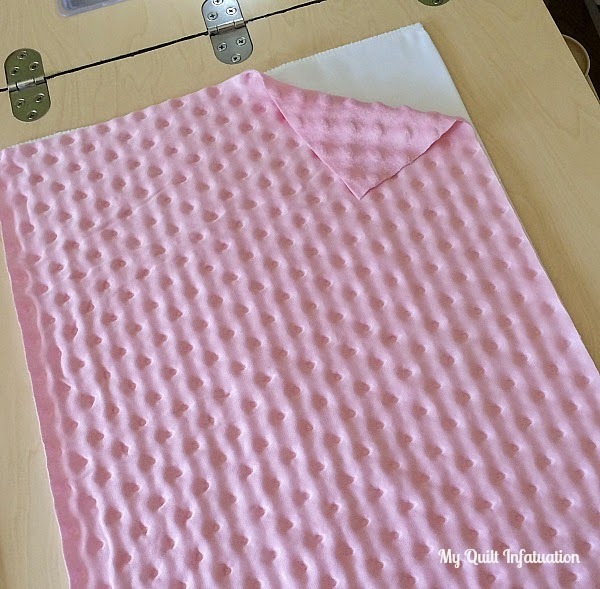 What a simple but brilliant way to transform mundane cloth diapers into something beautiful! I love this. I forgot I used plain old cloth diapers as burp cloths when mine were young. (Oops, just gave away my age.) Now with everyone using disposables, what do they use? These are beautiful, easy to make, and useful. Not to mention, soft for baby. A great gift!.